The results of three new phase 3 studies with the new anti–B cell humanized antibody ocrelizumab (Genentech) in multiple sclerosis (MS) were the major talking point here among delegates at last week's Congress of the European Committee for Treatment and Research in Multiple Sclerosis (ECTRIMS) 2015. Both the OPERA I and II studies in relapsing-remitting MS and the ORATORIO trial in primary progressive MS were described as "ground-breaking" in their own ways. The OPERA studies suggested ocrelizumab may be a highly effective agent in relapsing-remitting MS but without the serious adverse effects seen with other, similarly potent agents. And the ORATORIO trial is the first phase 3 study to show a slowing of disability progression in primary progressive MS. 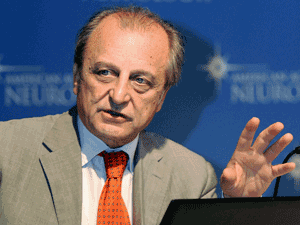 In his summary of clinical highlights of the ECTRIMS meeting, Jaume Sastre Garriga, MD, Hospital Vall d'Hebron, Barcelona, Spain, described ocrelizumab as a "game changer." "In relapsing-remitting MS it has shown a significant reduction in relapse rate and heavy suppression of inflammation as shown by reduction in gadolinium-enhancing lesions, without serious side effects as yet," he said. He added that the primary progressive result would reinvigorate research into this condition. Professor Giancarlo Comi, Università Vita-Salute San Raffaele, Italy, who was involved in the ocrelizumab studies, told Medscape Medical News, "The impressive efficacy and safety seen in the OPERA studies suggests that ocrelizumab could be used very early in the disease process and may completely change the paradigm of how we treat relapsing-remitting MS. And the ORATORIO study suggests the benefit may also extend to primary progressive MS."
Lily Jung Henson, MD, Piedmont Physicians, Atlanta, Georgia, who was not involved in the current studies, referred to the OPERA results as "amazing." "The NEDA [no evidence of disease activity] data are very impressive. And so far it looks very well tolerated. If anything, it has a better safety profile than β-interferon. It is not often that you come out of a session thinking that looks really exciting," she said in an interview. On the ORATORIO trial, she added: "The results are wonderful news. It will be interesting to see what the adverse events may be with long-term follow-up, but at the end of the day, we may finally have something to offer our primary progressive MS patients."